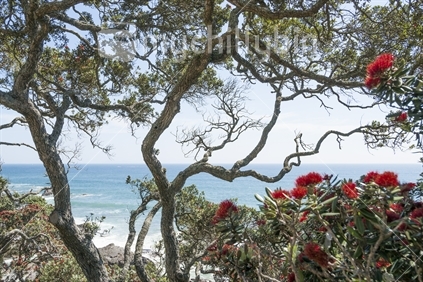 View through branches of New Zealands native Pohutukawa tree out to sea. From the slopes of Mount Maunganui. View through branches of New Zealands native Pohutukawa tree out to sea. From the slopes of Mount Maunganui - mychillybin genuine NZ photo image.